ST. LOUIS (AP) — A St. Louis official who joined protests after a white police officer was acquitted of murder last year in the shooting of a black man is suing over the police response to the demonstrations. Democratic Alderwoman Megan Ellyia Green alleges in the federal lawsuit filed Tuesday that police used tear gas on her without justification on Sept. 15, 2017 , following a demonstration after former Officer Jason Stockley was acquitted of first-degree murder in the death of drug suspect Anthony Lamar Smith. Green’s lawsuit said she suffered from respiratory problems for six months and remains fearful of police. St. Louis City Counselor Julian Bush declined comment Wednesday. 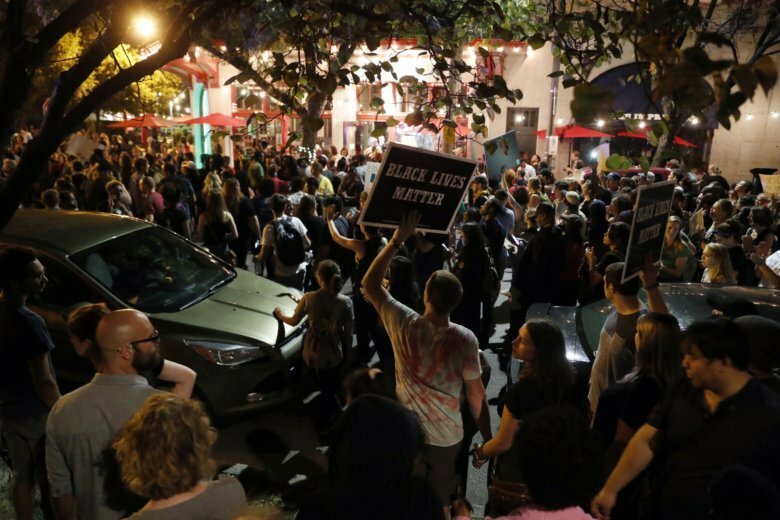 The lawsuit comes a little more than a week after 14 federal lawsuits were filed accusing police of arresting and roughing up innocent protesters, onlookers and journalists during a downtown protest two days after the Stockley verdict. Stockley testified that the shooting was in self-defense because Smith was reaching toward a gun in his car. Prosecutors accused Stockley of planting the gun. Police declined to comment on Green’s lawsuit Wednesday but have said in that past that the protests were often violent. Police have noted that 30 officers were injured, including some who still haven’t recovered. Green’s lawsuit said she joined with protesters in a march the night of the verdict. Hundreds of people that night surrounded the home of Mayor Lyda Krewson, which was damaged with paint and broken windows. Police in riot gear broke up the protest, using tear gas to disperse the crowd. Green was among 100 to 150 people who took refuge in a synagogue to avoid the tear gas. The suit said she stayed inside for about an hour as police pounded on the door and tear gas hung in the air outside. “The symbolism of citizens seeking refuge in a synagogue while out of control government actors pursued them was not lost on Ms. Green,” the suit said. As she headed home, she was among a small group allowed to cross a police line to get to their cars, the lawsuit states. An armored vehicle passed by before circling back, dispersing more tear gas, it says. Khazaeli said any damages awarded to her would be used to establish a fund to support regional racial equity infrastructure that was recommended by the Ferguson Commission after protests that followed the fatal police shooting of 18-year-old Michael Brown, who was black and unarmed, by a white officer in nearby Ferguson, Missouri, in August 2014.